A suspected outbreak of cholera has killed at least 49 people in central Haiti, officials say. The director-general of the health department, Dr Gabriel Thimote, said he was awaiting laboratory test results to confirm cholera was the cause. The victims suffered diarrhoea, acute fever and vomiting. More than 450 people are being treated in hospital. The outbreak is centred in the Artibonite and Central Plateau regions, north of the capital Port-au-Prince. Cholera is an intestinal infection caused by a bacteria transmitted through contaminated water or food. The source of contamination is usually the faeces of infected people. It causes diarrhoea and vomiting leading to severe dehydration, and can kill quickly if left untreated. It is easily treated though rehydration and antibiotics, however. Dr Thimote told the Reuters news agency that of the 15 specimens so far tested, 13 led him to believe there was a cholera outbreak. Health Minister Alex Larsen also said he believed it was cholera. 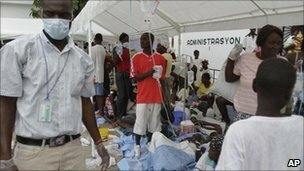 The president of the Haitian Medical Association, Claude Surena, told the AFP news agency that 135 people had died and 1,500 were infected. Dr Thimote said the worst-affected areas were Douin, Marchand Dessalines and areas around Saint-Marc, about 100km (60 miles) north of Port-au-Prince. Local hospitals were “overwhelmed”, and a number of people were being evacuated to clinics in other areas, he added. At one point on Thursday, hundreds of people lay in the car park of St Nicholas hospital in Saint-Marc, with intravenous drips in their arms to treat dehydration, until it began to rain and they were rushed inside, the Associated Press reported. The Pan American Health Organization (Paho) had sent two teams to the south of Artibonite, near Saint-Marc, a doctor with Paho told the BBC. Pending the final test results, officials from Paho and the UN Office for the Co-ordination of Humanitarian Affairs (OCHA) attributed the deaths to “acute diarrhoea”. They said they were concerned by the severity of the outbreak and the high number of reported deaths. “Nothing can be verified at the moment. We have no numbers, no epidemiological data,” said Dr Michel Thieren of Paho. The symptoms could be associated with a number of diseases, he added. There were fears of a cholera outbreak in the aftermath of January’s devastating earthquake, which killed some 250,000 people and left 1.5 million homeless. Many people are still living in makeshift camps with unsanitary conditions and little access to clean drinking water, but there were no outbreaks, according to the World Health Organization (WHO). The Artibonite department was not badly damaged in the earthquake but thousands of people who lost their homes have moved into camps or are living with relatives there.